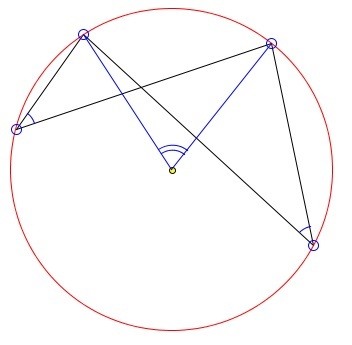 Two angles inscribed in a circle, if they subtend the same arc, and are thus associated with the same central angle. The two are therefore equal. In fact, the opposite is also true: if ∠CAD = ∠CBD and the angles are "similarly oriented", then the four points A, B, C and D are concyclic. The directed angle (AC, AD) is the angle through which the ray AC should be rotated in the positive (counterclockwise) direction in order to coincide with AD. The definition simply propagates the idea of orientation of a line (positive/negative direction on a line) and that of a plane (positive/negative rotation of a plane) to that of angle. We may reformulate the above statement: four non-collinear points A, B, C, D are concyclic iff (AC, AD) = (BC, BD). (l, l'') = (l, l') + (l', l''). Quite often we wish to consider straight lines instead of rays. It is common then to work with directed angles modulo 180°.